Here’s a book for the parents, grandparents, aunts, uncles and caregivers out there who might like to harness their inner ‘geek’ and explore some top geeky projects with the kids in their lives. 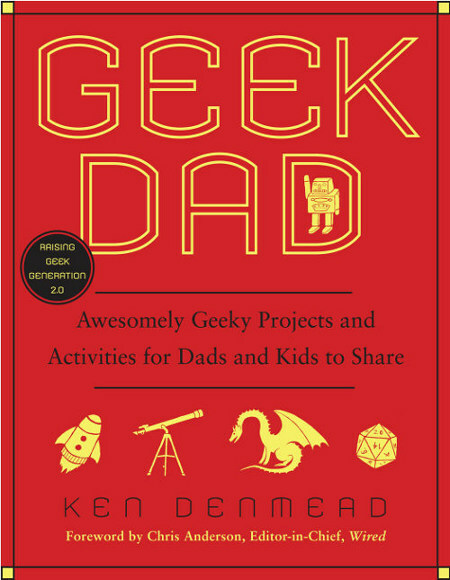 The book is called Geek Dad: Awesomely Geeky Projects and Activities for Dads and Kids to Share. I have purposefully included everyone who has children in their lives, not just dads, as I think there’s geeky (I personally prefer the word ‘intellectual’) tendencies in all of us and as a mother I most certainly want to try some of the activities in the book. The ‘Fly a Night-Time Kite Ablaze with Lights’ and ‘Launch a Video Camera with Balloons’ sound pretty swell to me – but most importantly I know my daughter would love it! Written by Ken Denmead, editor of the GeekDad blog, the book is aimed at tech-proficient dads of the digital-age, with projects galore and illustrations. Even though the book is written squarely for dads, it’s perfect for anyone wishing to cultivate a love of science, technology and education in little lives. For weekends full of adventure and invention, head to Fishpond where Geek Dad is $21.97.